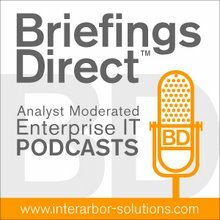 The next BriefingsDirect thought-leader interview focuses on the Ariba product roadmap for 2015 -- and beyond. Ariba’s product and services roadmap is rapidly evolving, including improved business cloud services, refined user experience features, and the use of increasingly intelligent networks. BriefingsDirect had an opportunity to learn first-hand how at the recent 2015 Ariba LIVE Conference in Las Vegas. To learn more about the recent news at Ariba LIVE -- and also what to expect from both Ariba and SAP in the coming months -- we sat down with Chris Haydon, Senior Vice President of Product Management at Ariba, an SAP company. The discussion is moderated by me, Dana Gardner, Principal Analyst at Interarbor Solutions. Gardner: Before we get to the Ariba news, what do you see as having changed, developed, or evolved over the past year or so in the business network market? Haydon: It’s been a very interesting year with a lot of learning and adoption for sure. There's a growing realization in companies that the networked economy is here to stay. You can no longer remain within the four walls of your business. It really is about understanding that you are part of multiple business networks, not just a business network. There are business networks for finance, business networks for procurement, and so on. How do you leverage and harness those business networks to make your businesses more effective? Gardner: So it’s incumbent upon companies to take advantage of all these different networks and services, the data and analysis that’s driven from them. But at the same time, they need to retain simplicity. They need to make their users comfortable with this technology. They need to move toward a more mobile interface. How do we balance the need for expansion, amid complexity, with simplicity and direct processes? Haydon: It’s a difficult balance. There are a couple of ways to think about it as well. Just to pick up on the point on how businesses are changing, certainly the end-user expectation is dramatically changing. Whether it’s the millennials coming into the workforce, the nature of apps, mobile apps, in our personal lives driving the need, the requirement, the desire to have that in our business lives is there. From an Ariba perspective, we believe our job is to manage complexity for our customers. That’s the value prop that people sign into. When we talk from a usability perspective about managing the complexity, it’s also about thinking about the individual persona or how the end-user really needs to interact to get the work done, how they can learn, and how they can use their different devices to work where they want and how they want. Gardner: It seems to me that among the technology leaps that we are making in order to accommodate this balance is there a greater reliance on the network, network-centric attributes -- intelligence driven into the network. How do you view the role of the network in this balance? Haydon: I think it’s fundamental, and we're definitely seeing it almost as a tipping point. It’s no longer just about the transactions, but about the trusted relationships. It’s about visibility into the extended value chain, whether that value chain is supply chain, financial payment chain, or logistics chain. It doesn’t matter what that process change or that value change is. It is insight into that trusted community, so you understand that it’s secure, that it’s scalable, and also that reliable and repeatable. It’s no longer just about the transactions, but about the trusted relationships. Gardner: It seems like we can put the word "hybrid" in front of so much these days. Tell us a little bit about why SAP HANA is so important to this network services tipping point. Many people think of HANA as a big data platform, but it’s quite a bit more. Haydon: Yeah, it is. In Ariba we've made strides on leveraging the HANA Technology, first with the Spend Visibility program. The great message about HANA is that it's not HANA for technology sake; it’s how HANA enables different business outcomes. That's the exciting thing. Whether it's on the Ariba Network, whether we start in our analytical platform and have an average of 50X or 80X average improvement in terms of some of the reports, that’s great. What was really interesting when we put HANA on to our Spend Visibility was that we got more users doing different types of reports because they could do this, they could iterate, they could change, they could experiment in a more interactive and faster way. We saw upticks in the behavior of how customers use their products, and that's the excitement of HANA. Taking it to the next step, as we looked upon HANA across our network and our other applications in terms of better and different types of reporting in terms of the network and having real-time visibility in insights from our trusted community, it’s just going to provide a differential level of value to any of the end-users, whether they're buyer, seller or any of our partners. Gardner: So we have a wider diversity of network participants. We need to connect them. We’re leveraging the network to do that. We're leveraging the ability of a strong platform like HANA to give us analytics and other strong value adds, but we also need to bring that single platform, that single pane of glass value, to the mobile device. User experience seems to be super important. Tell us a little bit about where you’re heading with that and introduce us to SAP Fiori. Haydon: It’s a massive focus for us from an innovation perspective. When we think about our user experience, it's not just about the user interface, albeit a very important part, but it's also the total experience that an end-user or a company has with the Ariba Suite and Business Network. Fiori is an excellent user-interface design paradigm that SAP has led, and we have adopted, Fiori elements and design paradigms within our applications, mobile applications as well as desktop applications. You will see a vastly updated user interface, based on Fiori design principles, coming out in the summer, and we'll be announcing that here at Ariba LIVE and taking customers through some really interesting demos. But, as you mentioned earlier, it's not just about the user experience. It's really about end users; we call them personas from a product perspective. You're in accounts payable or you're a purchasing officer. That’s the hat you wear. It really is about how you link, where you work, work anywhere, embracing modern design principles and learning across the whole user experience. It really is about how you link, where you work, work anywhere, embracing modern design principles and learning across the whole user experience. We've got some interesting approaches for our mobile device. Let me talk about the crossover there. We're launching and showing a new mobile app. We launched our mobile app early this year for Ariba’s Procurement suite. I had some great uptick the first week, when 20 percent of our customers activated and rolled it out. Some of their end-users are progressively scaling that. Again, that's the power of a mobile-app delivery. It shows the untapped demand, the untapped potential, of how end-users do, can, and want to interact with business applications today. At Ariba LIVE 2015, we are also announcing a brand-new application to enable shopping cart, adding, searching for the casual ad hoc end-user, so they can do their requisitioning and their owning of the contract items or ad hoc items wherever they are. To finish off, just as excitingly, we're really looking to leverage the mobile device and take its abilities to create new user experience design paradigms. Let me give you an example of what that means. Let’s just say you're an accounts payable clerk and you're a very conscientious accounts payable clerk. You're on the bus, on the way to work, and you know you have got a lot of invoices to process. For example, you might want to say you need to process an invoice from ACME Inc. before you do it for my next supplier. On your mobile device, you can’t process detailed information about an invoice, but you can certainly put it in your queue, and when you get to your desktop, there it is at the top of your to-do queue. Then, when you finish work, maybe you want to push a report on "How did I do today?" You did x things, you did y things, and you have that on your mobile device on the train on the way home. That's the kind of continuity construct that would bring you in, making the user experience about learning and about working where you are. Gardner: Before we go into the list of things that you're doing for 2015, let's tie this discussion at the high level about the networked economy, power network, and intelligence driven in the network, the user interface, with this all-important behavioral aspect of users wanting to use these technologies. One of the things that’s been interesting for me at Ariba LIVE is that I'm learning that user productivity is the go-to market. The pull of users that say they want these apps, they don't want the old-fashioned way, they want to be able to do some work on the train ride home and have notifications that allow them to push a business process forward or send it back. So how do you see the future of the total technology mix coming to bear on that user productivity in such a way that they're actually going to demand these capabilities from their employers? Haydon: It's interesting. Let's just use the example of a Chief Procurement Officer. As Chief Procurement Officer, you may have the old classic standard benefits of the total cost of ownership (TCO), cost reduction, and price reductions. But more and more, Chief Procurement Officers also realize that they have internal customers, their end-users. If the end users can't adopt the systems and comply with the systems, what's the point? If the end users can't adopt the systems and comply with the systems, what's the point? So, just getting to your point, it was an excellent thing. We're seeing the pull or the push, depending on your point of view, straight from the end user, straight through to the end-of -line outcome. From an Ariba perspective, how this all comes together really is a couple things. User design interactions are foremost in our design thinking approaches. These different user design interactions make products do different things and work together. It also has some great impact on our platform, and this is where with SAP and HANA Cloud Platform gives us a differential way to address these problems. One of these aspects here is to keep up with these demands not necessarily out of left field, but out of specific market or industry requirements. We need to make sure that we can expand our ecosystem from an Ariba perspective to encompass partners and even customers doing their own things with our platform that we don't even know about. For some specific investments with HANA and the HANA Cloud Platform it's to make our network more open and we're also looking at some targeted extensibility scenarios for real applications. Gardner: Let's go to the road map for 2015 Ariba products. Let's start with Spend Management. What's going on there? Haydon: In 2014, we brought more than 330 odd significant features to market, almost one a day. So we have delivered a lot of innovation. About 89 percent of those were delivered -- and this is important to our ongoing roadmap because we're cloud -- because we work with our customers in their own on-demand environment. They entrust their business processes to us. We're delivering more and more features in toggle mode -- or configured on or configured off. We're letting our end users and our customers consume our innovation even though it's intrinsic to the product. That's one big improvement we made in 2014 and we want to carry through in 2015. In terms of spend management, again, we have some great new investment in Ariba. SAP continues to invest in Ariba, and we continue to turn out more innovation. We have some innovation from enhancing capabilities to support the public sector. We're adding and extending in globalization capabilities. We're adding specific functionality to improve the security, the encryption, of applications. We have 16-odd years of transactional history on the Ariba Network. We look at that in conjunction with our customers. Then, there are some more targeted features, whether it's improving demand aggregation for our procurement applications, supporting large line levels and outsourcing and contract management applications, or improving our catalog searching capabilities with type-ahead and improved content and publishing management. It's really end to end. Gardner: There are sort of four buckets within the spend management, indirect, contingent labor, direct, and supply chain management issues. The new big one was the Concur acquisition, travel and expense. Anything new to offer on understanding better spend management, better spend visibility, across these buckets? Haydon: Of course. When we work with our customers, we have 16-odd years of transactional history on the Ariba Network. We look at that in conjunction with our customers. We see these big four major spend segments, indirect and MRO, as you mentioned, supply chain indirect, services, contingent labor, travel and expense, and, of course, the distribution of that spend type changes per industry. But what we're really focused on is making sure that we can get end-to-end outcomes for our customers across the source-to-pay process. I'll touch on all of them in turn. In indirect MRO we're just continuing to drive deeper. We really want to address specific features in terms of compliance and greater spend categories, specifically with Spot Buy, which is a product we are out there trialing with a number of customers right now. In contingent labor and services management, we've done some excellent work integrating the Ariba platform with the Fieldglass platform, made some huge strides in linking purchase orders into the Fieldglass platform. Let Fieldglass do what they do great. They're the number one market leader in bringing the invoices back to the network over the common adapter. In terms of direct and logistics and supply chain, we brought to market, like we mentioned last year, some direct materials supply-chain capability, co-innovating with a number of customers right now. We added subcontracting purchase order (PO) for complex scenarios in the summer and have done some great work in extending the capability to support consumer package and retail supplies. We've done some really interesting strides, and again, expanding the spend categories that we can support on there. And last but not least, Concur. It's number one in travel, and we're excited to have that part of the family. Again, from an SAP perspective, when you look at total spend, there's just an unparalleled capability to manage any spend segment. We're working pretty closely with Concur to ensure we have tied integration and we work at how we can leverage their invoicing capability as a complement to Ariba's. Gardner: Line-of-business applications is one of the things that's intrigued me here. Hearing your story unfold is this "no middleware, yet expansive integration -- end to end integration across business processes and data." A resounding message from our customers . . . is that we need seamless, simpler integration between our cloud applications and our current applications. So in this line-of-business category, explain to me how you can be so inclusive leveraging the technology. How does that work? Haydon: Let me unpack that a little bit. A resounding message from our customers, particularly since the acquisition, is that we need seamless, simpler integration between our cloud applications and our current applications. Would they be on-premise? I'll talk about Oracle and other clients in a little bit, but specifically for our SAP ERP systems, we’ve really worked hand in glove with our on-premise business-suite partners to understand how we can move from integrate to activate. And so what we brought to market pretty significantly with the business suite is the ability for any SAP Business Suite customer to download an add-on that basically gives them an out-of-the-box connectivity to the Ariba Network. We continue to invest in that with S/4HANA upcoming, where we are planning to have native connectivity to the Ariba Network as part of a standard feature of S/4HANA. For our other customers, the Oracle customers and other major ERP systems out there, we continue to invest in open adapters to enable their procurement and finance processes across the network or with any of our cloud applications. Gardner: There's something that's always important. We leave it to the end, but we probably shouldn't -- risk management. It seems to me that you're building more inherent risk-management features inside these applications and processes. It's another function of the technology. When you have great network-centric capabilities and a solid single platform to work from, you can start to do this. Tell us a little bit more about that. Haydon: This is a really exciting and emerging area. More and more leading-practice companies are starting to manage their procurement and their supply chains from a risk basis, the risk, the continuity of supply, security of supply. What happens if x, what happens if y? You eye your supply chain. If there is, heaven forbid, some contamination or whatever traceability issue somewhere in your supply chain, and you're a large company or even a small company, now you're held accountable. How do we start helping companies understand the risk that exists within their supply chain? We think that the business network is the best way to make sense of the risk that exists in your supply chain. Why? One, because it's a connected community; and two, because you think about the premise. We already have the transactions, 750 billion plus to spend. We already have a million plus trusted, connected relationships. But that's the first step. We also think about where we can have differential inputs, third-party inputs, on types of dimensions, and we think it's these risk dimensions or domains of information that matter, whether it's safety, performance, innovation, diversity, environment, or financial risk. It could be any of these domains, whether it's information from Dun and Bradstreet, information from Made In A Free World, which has a global slavery index. Whatever these dimensions of information are, we want to bring them in to our applications in the context of the transaction, in the context of the end-user. Imagine when you do a sourcing event if you could be notified of some disruption or some type of risk in your supply chain before you finally award that sourcing event or before you finally sign the contract. That provides a differential level of outcome that can only really be delivered through a business network in a community.